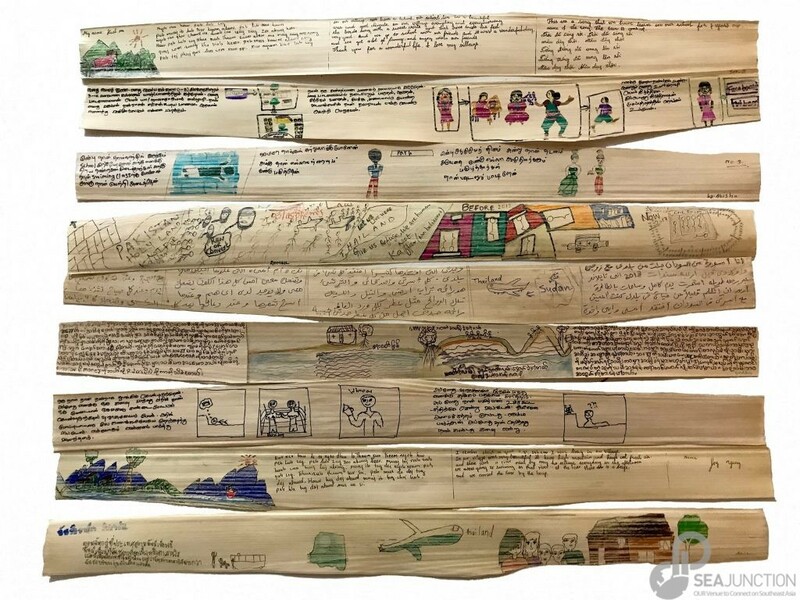 On 4 November 2017 at 5PM, the month-long exhibition “Shift Maps” will be launched at SEA Junction exposing the personal live histories of refugees and migrants living in Bangkok as written and illustrated by them on palm leaf manuscripts made from the Talipot Palm, also known as the ‘Shadow Palm’ (Corypha umbraculifera; Thai: Bai Larn). The bulk of manuscripts were produced in two workshop sessions conducted by Bangkok-based artist Varsha Nair at SEA Junction on 26 and 28 October by a group of refugees and migrants composed of clusters of family members as well as young refugees on their own from a variety of countries including Vietnam, Myanmar, Sri Lanka, Pakistan, and Sudan. They worked with leaves to tell their personal stories, reflecting about “who we are, where we come from, our connection with the past, and present way of being”. Recording oral histories, they drew and wrote their stories, from memory and based on their current reality – life stories connected with location, relocation, dislocation – the physical, emotional and psychological shifts – at times subtle and at times tectonic. Additional palm works were created at a workshop for 365 Days: LIFE MUSE (Model study for Nongpo community’s foreign laborers), a project by Baan Noorg Collaborative Arts and Culture, curated by jiandyin (Jiradej and Pornpilai Meemalai). The Palm can be considered as being one of the first migrants in the world – dispersing itself by floating on the seas, arriving in far-flung places and rooting down way before humans appeared on the scene. Palms continue to be an important part of our daily life. We also revered them using their leaves to record what was once oral history and sacred discourses, as evident in traditional palm leaf manuscripts. This tradition is a common one that connects India, Myanmar, Thailand, Cambodia, Laos, and Indonesia. Individuals from different parts of the world who now find themselves in-between places created the palm leaf documents presented here. They can be seen as current records of flux and of memory – of horizons lost, found, and desired. At the opening, and intermittently during the course of the exhibition, short videos created by some of the same refugees and some others will be shown. They were made as part of a research project conducted by Rebecca Warren, in which several young refugees wrote and created digital poetry based on a poem by George Ella Lyon, called ‘Where I’m From’. The poems explored the young person’s sense of identity, memory, and attempted to capture their journey through life with images and descriptions of things that they’ve felt, sensed, touched, heard, smelt, seen, the experiences that make us who we are. Irrespective of varying degrees of elaboration, each is unique and poignant in its own way. The opening will also feature a panel discussion including Varsha Nair, Rebecca Warren as well as representatives of refugee organizations. This event is the sixth of a series of events on movements of people in Southeast Asia entitled ASEAN People in Flux, which is organized by SEA Junction in collaboration with the Heinrich Boll Stiftung Southeast Asia. The series consisting of seven interrelated events aims to examine the complexity of intraregional mobility spurred by regionalization efforts and to discuss the policies governing it. In particular, by putting a spot on different kinds of people’s movements, the series highlights the double standards in the ASEAN’s approach to mobility. On one side, ASEAN promotes “people to people connectivity” by facilitating movements for business, study and tourism, while on the other side it limits migration of much needed “un-skilled” workers to exploitative contract labor schemes and it refuses to recognize refugees, asylum seekers and displaced persons. These double standards were clearly illustrated by the first event of the series on “refugee crisis in ASEAN” as contrasted to the booming industry of medical tourism discussed in the second event. The third event presented an additional dimension of policy discrimination from a gender perspective by focusing on women migrant workers in ASEAN, while the forth focused on the often-neglected topic of pre-departure policies to protect migrants. The fifth event returns to explore privileged flows, this time the facilitated intraregional movements of students, as contrasted to the young refugees who tells their stories of dislocation and exclusion from education opportunities in this sixth event. Rebecca Warren works for The British Council in Bangkok, Thailand. She also volunteers as a teacher with refugees and is conducting doctoral research into the educational experiences of young refugees in Bangkok. The participating refugees for now prefer to remain anonymous, but names/pseudonyms may be provided at a later date if conditions allow it.